Extended TreeView is flexible hierarchical .NET control for Windows Forms. Use it when you need multi-line text in the node or place node elements in the table layout. You can display different content in the selected and in the normal node. 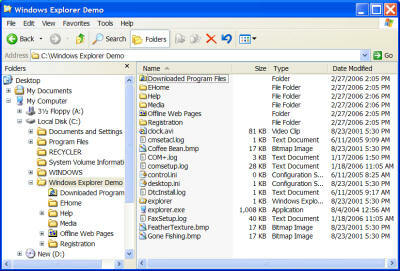 FolderView.Net Control brings drop-in Windows Explorer folder browsing functionality to your app featuring AutoUpdate,dragdrop,icons,contextmenus,virtual items,infotips.The new version fully supports VS 2008 and vista and has some new features. The best app for keeping all notes securely encrypted on external USB drive. It allows data access restriction, tables, alarms, and simply looks superb. Try it! Add Gantt Chart or Scheduling capabilities to your .NET WPF application. Use ActiveGanttVBW to build Gantt Charts, Rosters, equipment/location rental, TV/Movie scheduling, and many other applications.